Can you help? Not sure who this lovely girl is - any ideas? I love the detail of her stockings and her earrings, her feet all ready for her high shoes and the lovely dress. She is owned by my sister who knows nothing about her and has passed her on to me. I can't find out anything here in the UK. I have been searching the internet and found Toni and Miss Revlon dolls which are the nearest I have found so far. Hello. Please look at the back of the doll. 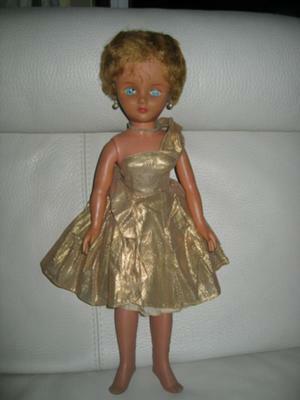 A circle P was a generic knock-off doll similar to Revlon. Deluxe Reading dolls were inexpensive dolls that showed up in supermarkets before Christmas. Deluxe Reading made both girl and boy toys that were ordered and then shipped out in time for Christmas. Deluxe Reading dolls stood the test of time rather well. I have three that I picked up in "antique" shops for almost nothing. They don't have the cachet of Revlons but I find them adorable: slightly pouty mouths, childish faces and modestly endowed as teen dolls. If you look up Deluxe Reading on the Internet, you will find information from people much more informed than I am.